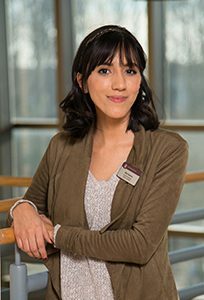 Elizabeth “Elly” Huereca is the first undergraduate student to receive the Indiana University East School of Education Minority Scholarship. Huereca of Fountain City, Indiana, is a junior elementary education major. She moved from Palmdale, California, to the area in 2011 to pursue her degree. The School of Education is committed to promoting diversity within its student body and in the region’s local schools. Research suggests that increasing the number of highly effective minority teachers is one of the ways to close the achievement gap that currently exists. The School of Education raised funds for the scholarship through the IU East Campus Campaign for the creation of scholarships for minority teacher education students. Gifts from the scholarship help to support undergraduate scholarships for students in the School of Education. IU East’s School of Education offers a Bachelor of Science in Elementary Education and a Bachelor of Science in Secondary Education. The school also offers a Transition to Teaching program which supports qualified individuals who want to transition from a career outside of education into being a licensed teacher. At the graduate level, the school also offers a Master of Science in Education. For more information, contact the IU East School of Education at (765) 973-8224.